This spring’s trend puts a new spin on an old classic: knitwear. KNITWEAR never really disappeared from the style lexicon; it’s just changed its shape over the years. The 1950s gave us preppy, puffy popcorn knits, the ’60s vibrated with Missoni’s zigzag formations, and the ’70s swaddled fashionistas in cozy cocoon sweaters. This year’s amalgamation combines the elements of decades past for a wide range of options, from Sonia Rykiel’s colorful cool patterned tops to daring deconstructed pieces from the likes of Isabel Marant. The key to pulling off knitwear as an on-trend fashion, and not just Grandma’s hand-me-downs, is to move out of winter’s heavy weaves and into spring’s crochet club. As we breeze into—fingers crossed—warmer days, vary the thickness of your knits (see above). Openwork (loosely knit) pieces allow for light layering, while color-blocked pullovers bring boldness. 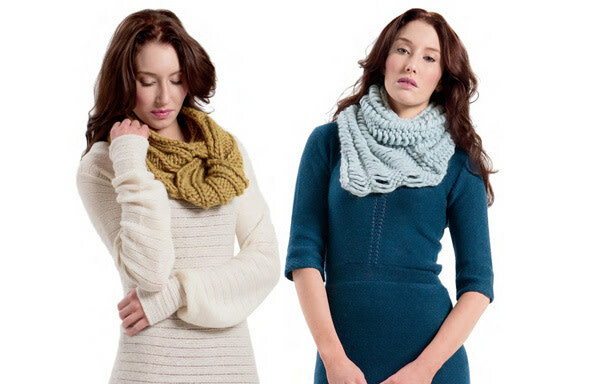 Or simply dress up other duds with circular scarves (like the ones pictured) and delicate turbans. Can’t find just the right piece for your wardrobe? Do Portland proper: grab a pair of knitting needles or a crochet hook, and get to work. Grandma can show you how.